The podcast movement is growing at a tremendous rate and its benefits are far-reaching. According to the Washington Post article, “Podcasts are back – And Making Money,” Apple podcast subscriptions reached 1 billion listeners. Shows like “99% Invisible” average 1.5 million downloads per month. The list goes on. So what does this mean for you or your business? Podcasting creates an avenue to reach, inspire, and influence a large group of people. It’s a way for you to connect your brand or message with your audience. It’s also an income stream. So how do you create a podcast? What should your podcast be about? What equipment should you purchase? The first and maybe most difficult part of the entire process is choosing a topic. What is your podcast going to be about? What is the purpose of your podcast? Instinctually, we want to choose a broad and adaptable topic, something that will give you a lot of content. The opposite is true- you want to be specific and clear. Pick something niche. Many of the most successful podcasts are on very specific topics. Make sure the topic is something you enjoy. Ask yourself: Can I see myself producing 20 episodes on this topic? 50? 100? 1,000? Again, many of the most successful podcasts have a hundred or more episodes. Make sure you choose something you won’t get bored with after several episodes. Check if your topic is interesting. Last, know your target audience and create a podcast that is dedicated to them. Go as far as determining a specific listener. How old is your ideal listener? What motivates your ideal listener? Keep these things in mind as you start planning and creating your show. The clearer your vision, the better your podcast will be. Just as you should know your topic before starting your podcast, you should know the format of your show. How long will it be? Will you be interviewing guests, monologue, or narrative? Will it be free-form or have consistent segments? What matters more than your format is that you are consistent in whatever you choose. Successful podcasts have a variety of different formats. While there isn’t necessarily a “correct” way to format your show, a couple formats seem to perform better than others. Consider a shorter length. Most of the successful podcasts on iTunes are in-between 20 and 40 minutes long. The sweet spot is around 25 minutes. It’s long enough to develop a connection and interest in the topic but short enough to be consumed on the average commute. Include elements of story. Story is powerful. Good stories captivate attention. Many of the most popular podcasts contain elements of narrative, emotion, setting, and story. Picking a name can be difficult. You want something that fits your personality as well as the personality of your show. It should be memorable and easy to read. I recommend brainstorming several names and running them past different people (friends and strangers) to see what they like. Ultimately it’s your choice but getting the opinions of others helps. You will also want to see if the name you chose has the corresponding domain, social media accounts, and copyrights available. When starting out, many people might start by using the microphone built into their laptop or on their phones. Don’t underestimate how decent this sound quality can be if you set them up correctly. 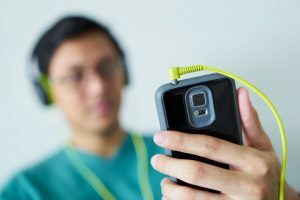 However in the longtime, you’ll probably want some external device to either record straight to your computer or by using external device like a digital recorder or mixer. How you record will also determine your pre-production (what you do before recording) and post-production (what you do after the recording) workload. If you’re not entirely sure if it’s for you then I’d recommend that you go with the following equipment to get you off the ground. 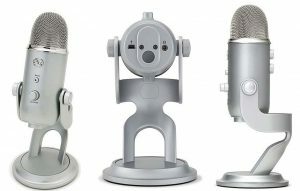 I’m not going to overly complicate things here by giving you a ton of options to choose from (because there are lots to choose from) There really is in my opinion only one USB mic worth using. 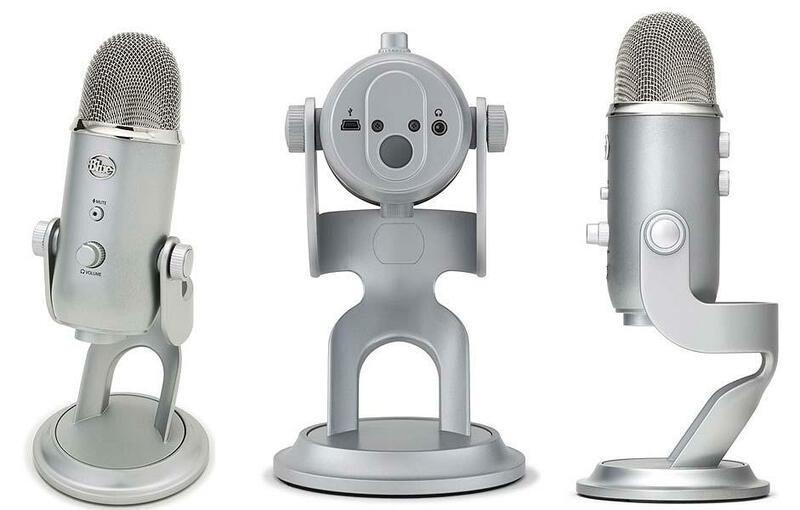 The Blue Microphones Yeti USB Microphone will do the job nicely for you. This mic is £99 on Amazon, comes with it’s own stand and plugs directly into your laptop USB connection. It also has a mic jack on the end so you can plug in headphones and you can also adjust the volume to the headphones. Sound quality is very good, and it can be set to record in 360′ sound. This means if there are a group of you recording a podcast; you sit the microphone in the center of a table and all sit around it; it will pick up all the voices around it. Nothing much to say about the laptop computer other than if your machine is a dinosaur, get a new one. A sluggish or troublesome machine could mean losing those valuable recordings. You have several options when it comes to audio software, but to keep it simple, I’m only going to offer you two. If you’re on a Mac you’ve got the option to use GarageBand, which comes free with your Apple machine. If you’ve never used Garageband or Audacity before then you’ll need to spend the time learning how to. But trust me, it’s not that difficult to get the grip of. Understand a story is leaving details out. You are telling a lie of omission. In other words, it’s ok to edit out parts of what your interviewee said as long as you stay true to his or her intent. Find the human moments, the things the audience will connect with. OK, now you’re ready to start recording and creating your show. For many people, recording the first podcast can be daunting. Here’s the reality: everyone hates the sound of their own voice. It’s not comfortable for anyone recording the first time. The best thing you can do is jump straight into attempting the first episode. If you truly hate the way it turned out, record it again. Should you start with Episode 00? Regardless of the kind of show you want to have, many podcasters choose to have “episode 00” for the first show. Typically, this is an “abnormal” episode. They are usually used as a short introduction to the host and the show as a whole. If you’re creating a podcast to promote a business or idea, episode 00 would be an excellent place to briefly discuss it. Many new listeners, regardless of the amount of episodes available in a series, check out podcasts by scanning the first and most recent episodes. Having an episode 00 isn’t necessary but it is an easy way to inform new listeners on who you are and what the podcast is all about. How long will the podcast be? Remain consistent. Many of the largest podcasts build expectations and trust with their audiences by being consistent. Even so, consistency can look different from episode to episode. Maybe that means the same bumper, content, bumper format for every show. Maybe it’s in an underlying theme that’s rooted in each episode. Consistency doesn’t mean producing the exact same thing every time. It means finding small ways for your audience to feel familiar or at home when they listen to your podcast. Podcast to the target person in your target audience. Being simple and precise with the intent of your show will improve it tremendously. Remember, when you try to please everyone, you end up pleasing no one. There will be people who don’t like your podcast and that’s ok. In fact, it’s a good thing. Your goal is to speak specifically to your target audience. Don’t worry about everyone else. Find the human moments. Whether you’re podcasting alone or interviewing multiple guests for a single episode, find the moments in your facts or story that your audience can connect with. Stories are everywhere. Presenters use them, authors use them, and the best podcasters are using them. Find the ways you can tap into the human experience on your show. Don’t script what you’re going to say. Have a focus and make an outline. Bullet points on the big ideas of what you want to cover will help guide you and keep you on track. Avoid filler language as much as possible- things like “umm,” “and so,” or other words and phrases you say out of habit. These often waterdown and distract from your message. Be aware of your body language and expressions along with you speech. If you record while standing up, using hand gestures, and smiling the recording will sound more natural and inviting. Don’t record slumped over in your chair! Depending on the purpose of your podcast, there may be a need to conduct interviews to gain advice or experiences on a topic that you don’t have. Interviews are an amazing way to learn from others, supply interesting content to your audience, and to grow your network. I don’t recommend giving questions ahead of time. If the guest wants to see the questions, only give some of them (maybe half) and never ask anything that would require them to do research. Last, always send a reminder email with the necessary information one day before the interview. Do your research. Knowing your person and what to ask them is important for an interesting interview. Don’t go in without a plan. You are the interviewer. Have your questions ahead of time, be confident and be in charge. You want to ask questions that will get them to tell a story or get emotion. Don’t ask yes or no questions. You want to make the interviewee feel safe but know they are giving real answers to real questions. If the interview time starts to go long, politely ask for more time. Most important tip when you’re doing an interview: Trust your gut. You know when something is interesting or if it isn’t. If you are confused during the interview, your audience is confused. 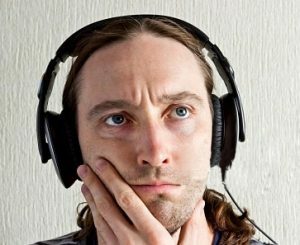 If you are bored while interviewing, your audience will be bored when listening. Ask questions to clarify and redirect the conversation to something more interesting. Finally, you are ready to upload your audio file to the web and push it out to iTunes. Like the rest of the sections we covered, you have a variety of choices on how to make your podcast audio accessible to your audience. 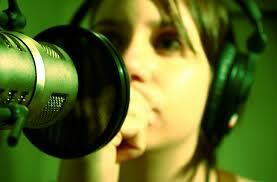 Like website hosting, media hosting is a space on the web dedicated solely to your audio files. Hopefully your podcast is going to receive plenty of downloads and listens. You need a server that can handle that amount of traffic and sharing with your website servers is the wrong way to do it. Libsyn.com: Libsyn has some of the best rates and dependability in the market. You won’t regret using Libsyn. Blubrry.com: Blubrry is very comparable to Libsyn in terms of rates and performance. Where they lack is in the usability of their website. It’s very clunky and difficult to navigate. Besides that, they are another quality choice. Soundcloud.com: Soundcloud is growing in popularity and taking steps to being a real competitor. They don’t compare with the previous two companies listed, but they should be a solid contender soon. Advice on media hosting plans: Estimate how much data you’ll need per month before signing up for a plan. For example, if your average podcast audio file size is 50mb and you plan on a new episode every week, that’s about 200mb needed per month. Try finding a plan that is a little larger than that (like 250mb) to avoid overage fees on your uploads. Last, make sure statistics are part of your plan package. Statistics will make it easier to see which shows are performing well, what areas are listening, and more. Once you have completed all the above steps you can go about submitting your podcast to iTunes. Go to iTunes and select iTunes Store from top navigation menu. From within the iTunes Store, go to the podcasts section. Paste the RSS feed URL into the field in the iTunes submit podcast window that you opened earlier. You will then be presented with an opportunity to review the podcast information you will have already setup with your hosting platform (podcast name, description, ect) If it’s not correct or you want to change it then hit cancel and go back into your hosting platform and make the necessary changes. If you happen to save it and submit without changing anything, but want to do so later, that’s not a problem. Every time iTunes goes looking for new episodes on your website it will pick up the edits you make. iTunes will take a day or two to approve your podcast. That’s it. Congratulations, you’re now live on iTunes! There’s a lot more things you’ll need to learn and understand as you progress and grow your podcast, but hopefully this page will give you enough information to start and grow, if you need more help here is the best place to find all the answer to your questions!